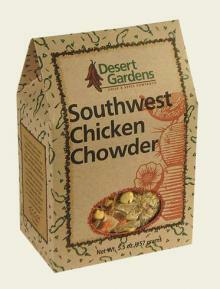 Corn and potatoes, green chile, celery and onions with the perfect blend of Desert Gardens seasonings all go into our Southwest Chicken Chowder – add milk, water, a little sour cream and 8 oz of cooked chicken to create an unforgettable meal – top with shredded cheddar cheese to kick this dish up to the next dimension! Providing Comfort - A Charity of Comfort Foods Inc.
A charity where we provide thousands of meals every month to the homeless and needy. This product contains milk and soy. This product does not contain peanuts, tree nuts, eggs, fish, crustacean shellfish, or wheat. Manufactured in a facility that processes egg, milk, soy, tree nuts and wheat. Potatoes, Corn, Carrots, Green Chile, Onion, Celery, Modified Corn Starch, Salt, Sugar, Chicken Broth, Hydrolyzed Soy Protein, Pepper, Turmeric, and Natural Flavorings. Add clams or sausage instead of chicken. Top off with cheddar cheese. Makes about 6 cups of prepared soup. Store unopened package in a cool, dry place. *Percent Daily Values are based on a 2, 000 calorie diet. Combine 3 cups of milk, 3 cups of water 1/2 cup sour cream and 8 oz cooked chicken. (Chicken optional, but yummy!) Stir in seasoning and vegetable package. Slowly bring to a boil. Simmer 30 minutes or until potatoes are tender. Delicious! 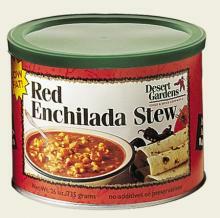 One of the best packaged foods on the market. The quality and convenience are exceptional. Everyone in my family enjoys this soup. Wife won a basket at an function of hers. This was one of the soups in it. It was a winner. 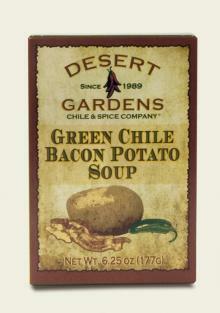 The best soup we’ve had in a long time that came from a package. 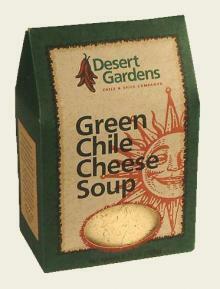 Picked up several different soup/chowders packs when I was in Taos this summer. Grabbed this one to have something for game night with family. Everyone loved it and the pot was empty before we knew it. Waiting for it to be restocked, so I can order online.